Chances are that sometime today you will snack. You are not alone. Research from The Hartman Group shows that a whopping 91% of consumers snack multiple times throughout the day. The notion of three square meals a day is long gone, as the boundaries further blur between what constitutes as a snack and as a meal. Snacking has become the most significant food and beverage occasion and dairy processors are wise to develop products that meet this need. This occasion is now being fine-tuned into the concept of mindful snacking. Research shows that taste is the number-one driver of snack selection; however, nutrition and health, or what the snack provides, is increasingly important. This is particularly true to the nearly nine out of 10 consumers who snack multiple times per day. 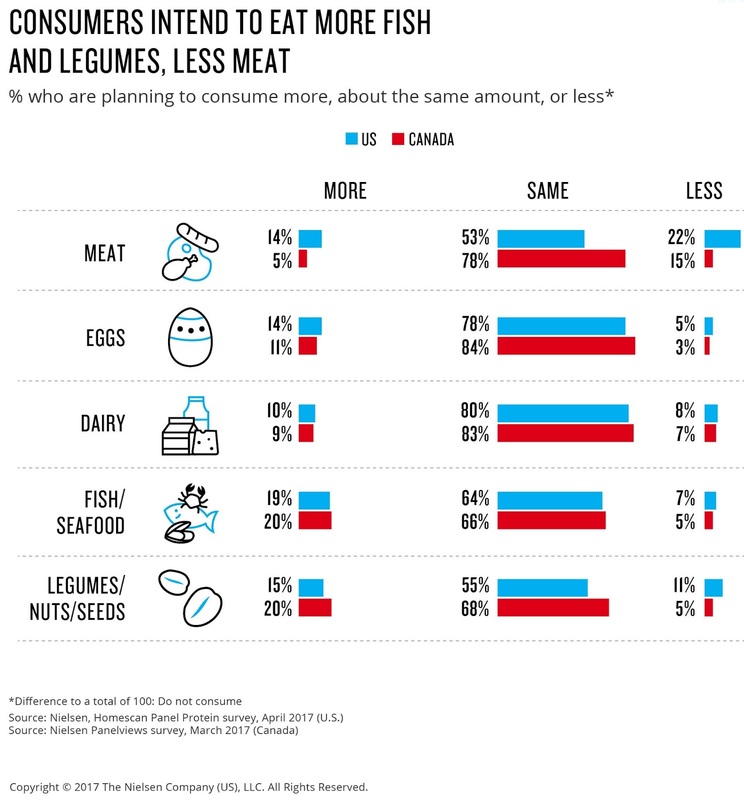 The Future of Snacking survey from The Hartman Group showed that grazing has become the new normal. 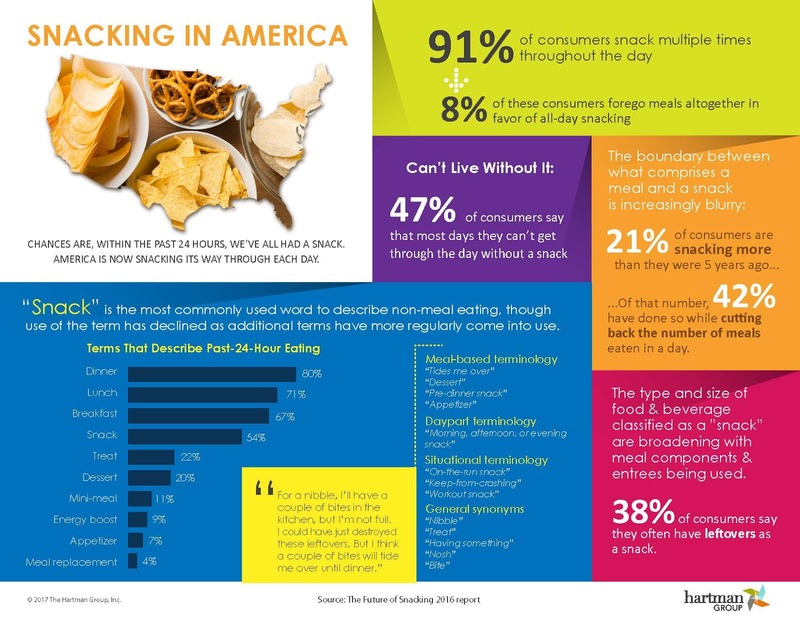 In fact, 7% of snacking consumers foregoing traditional meals altogether in favor of all-day grazing. There are three main drivers for snacking. More than half (56%) of the survey respondents indicated they snack for needs related to nourishment. This is all about hunger abatement, managing hydration, health and diet conditions, as well as snacking for sustained energy. Other motivators include seeking satisfaction and performance optimization. One third (34%) of respondents indicated they snack for needs relating to optimization in order to satisfy physical and mental performance demands. It’s important to note that snacking drivers change across the day, as do snack forms, flavors and even nutrition profiles. Morning snacks may be more about satiation and nourishment to get through a hectic start. An afternoon snack might be for energy or to satisfy a sweet craving. For the evening snack, maybe it’s about relaxation and pleasure. The fact is, what you eat between meals as snacks can and does affect health. To attract shoppers, dairy processors are exploring better-for-you formulations, bold flavors and convenience in order to grab share of the snacking dollar. Products are designed to meet these varied needs throughout the day. Many products, in particular in the dairy foods space, make natural, simple and clean label part of the mindful nutrition platform. These healthier choices include increasing consumer interest in energy, weight and blood sugar management. Dairy-based snack foods can be formulated to easily address these attributes. In addition to boosting protein content with high-quality complete dairy proteins, other ingredients to consider including in dairy-based snack foods are chicory root fiber-based inulin and oligofructose. These ingredients help manufacturers improve a product’s nutritional profile by reducing sugar, fat and calories while adding a valuable fiber source from nature. Being soluble and having a moderate sweet taste, they can be easily applied and maintain the taste and texture of the finished product. Slowly digested and absorbed sugars such as isomaltulose also make sense. A natural ingredient derived from beet sugar, isomaltulose provides balanced and sustained energy with a lower blood glucose rise and less insulin release. For more information on formulating mindful snacks, link HERE. 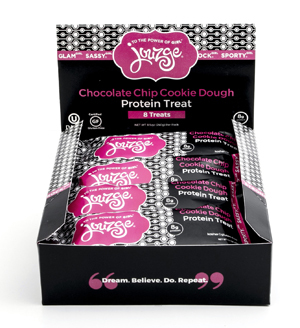 Jouzge represents confidence and serves as the inspirational name behind a new line of dairy-based snack bars developed to promote healthy eating and a healthy self-image among young women. 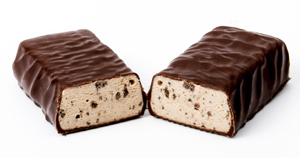 Created by University of Wisconsin-Madison alumnus and Oregon, Wis., resident Dana Wendt, with formulation assistance from the Center for Dairy Research (CDR), Jouzge bars were born out of Wendt’s desire to create a dairy-based snack for young girls that would fuel their self-love, rather than disparage it. Disillusioned by the messaging, Wendt worked with her daughter and her mother to develop the initial plans for a bar that would pair a positive message with an ingredient list and flavor profile young women and their caregivers could support. In terms of the messaging, Jouzge became a natural name for the bar, as it was the phrase Wendt’s father used as a self-affirmation each day before he headed to work at his B-to-B dairy company. Growing up in the dairy industry, Wendt was aware of the health benefits of milk and milk products, so she was eager to create a dairy-based bar. 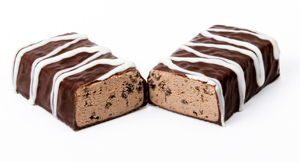 Wendt was also looking for that campus connection, so she reached out to CDR, located on the UW-Madison campus, to see if they could help her formulate a nutritious and flavorful bar. Experts in the application of dairy ingredients, CDR Dairy Ingredients, Beverages & Cultured Products Coordinator K.J. Burrington and CDR Associate Researcher Susan Larson, helped Wendt develop her product. For several months, the team experimented with a variety of different formulas, bar shapes, sizes, coatings and drizzles. Utilizing dairy proteins was an important part of the formulation process, which included the use of whey protein concentrate, whey protein isolate, milk protein isolate and whey protein crisps, which created a crunchy texture in some of the bars. The CDR team helped Wendt to create three flavors: Chocolate Peanut Butter, Chocolate Mint and Chocolate Chip Cookie Dough. Filled with dairy goodness, each clean-label bar contains no more than 130 calories and 7 to 8 grams of dairy-based protein and no more than 7 grams of sugar. The CDR also assisted with identifying a co-packer to bring the bars to market. Burrington suggested that Wendt also consider collaborating with industry to help the Jouzge business grow. In particular, Burrington shared the opportunities put forth by the Land O’Lakes, Inc. Dairy Accelerator program, which supports U.S. dairy entrepreneurs by providing access to business resources, financial support and more. Interested companies must apply and be accepted into the highly competitive program. A successful applicant, Wendt recently became a part of the program. All about positive messaging for girls and for dairy, Jouzge has been growing quickly. Launched in August, the bar is sold locally as well as on Amazon. Jouzge was recently accepted into the Amazon Launchpad program, which provides start-ups with the resources they need to succeed on Amazon. For more information on Jouzge, link HERE. 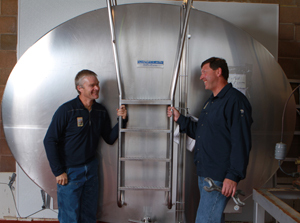 In addition to Jouzge, four other dairy companies were recently selected to participate in the new Land O’Lakes, Inc. Dairy Accelerator program. To qualify for consideration, each company was required to utilize dairy as a primary ingredient in their products. Dreaming Cow CEO Kyle Wehner grew up on rotational grazing dairies and assisted his family’s cheese company. Based in Georgia, Dreaming Cow is a family-owned company that produces low sugar, high flavor yogurt products using milk from local grass-based, New Zealand-style rotational grazing dairy farms. To read more about LUSH, link HERE. Founded in San Francisco by French pastry chef Maxime Pouvreau, Petit Pot blends French and California culinary heritages in its creamy, rich and gourmet desserts. 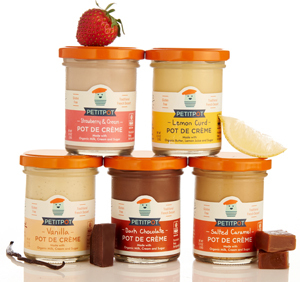 The company’s Pot de Crème and Riz Au Lait are packaged in glass jars and made with only a few, simple ingredients. To read more about Petit Pot, link HERE. 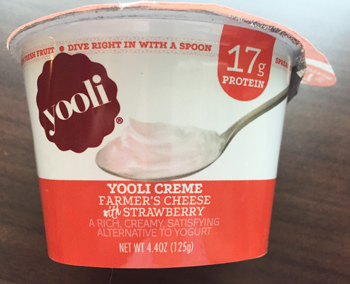 Inspired by the farmer’s cheese she ate as a child in Eastern Europe, Yooli Foods co-founder and CEO Yuliya Flynn developed a protein-rich, creamy dairy snack that is a unique alternative to yogurt. Based in California, Yooli produces snacks made with artisan-style farmer’s cheese. The protein snack is available in a variety of flavors. To read more about Yooli, link HERE. For more information on the Land O’Lakes, Inc. Dairy Accelerator program, link HERE. Miles ran up to me at 10:55am on Tuesday at the dairy barn, afraid that he missed the cow feeding program that ends at 11:00am. I kept it open a little longer for him because Wynnd, Janey, Flascha and Lucia were exceptionally hungry after their milking a half hour earlier, despite the unseasonably warm temperature. While he ran back and forth with handfuls of alfalfa-enriched hay, he informed me that he now drinks cows milk. I was confused so I queried his nanny. She explained that until Miles had spent time with me this summer at the zoo, his parents only bought a milk alternative, and for no particular reason other than personal choice. After I taught Miles all about milking, feeding and even how cows have one stomach with four chambers, he had been requesting cows milk. And now he gets it at home. As you can imagine, this brought tears of joy to my eyes. It confirmed what I say and write often. Marketers need to tell the story of milk. Consumers will drink it up. Here’s more promising news about dairy. Protein content claims continue to influence retail food purchases as well as dining orders in establishments that list nutrition information. 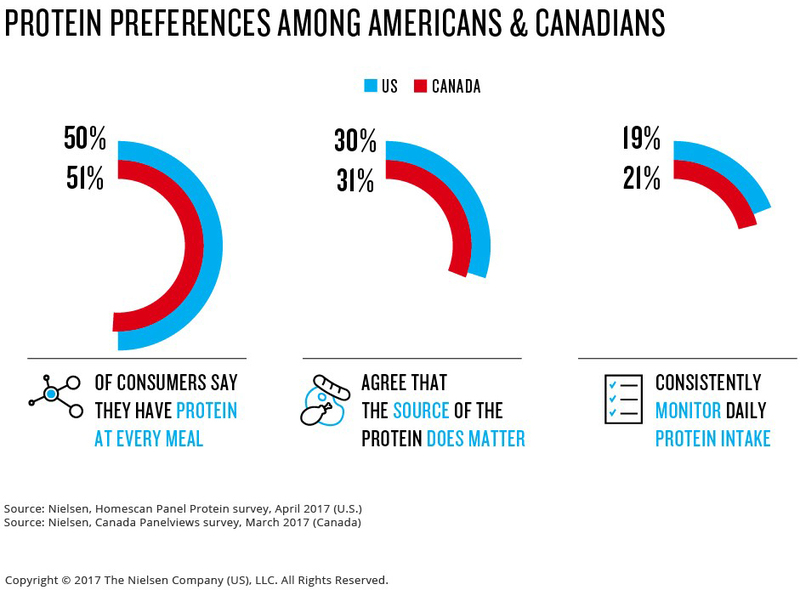 The Nielsen Company conducted research in early 2017 using its U.S. Homescan network and its Canada Panelviews database to better understand what consumers’ preferences are when it comes to protein selection. 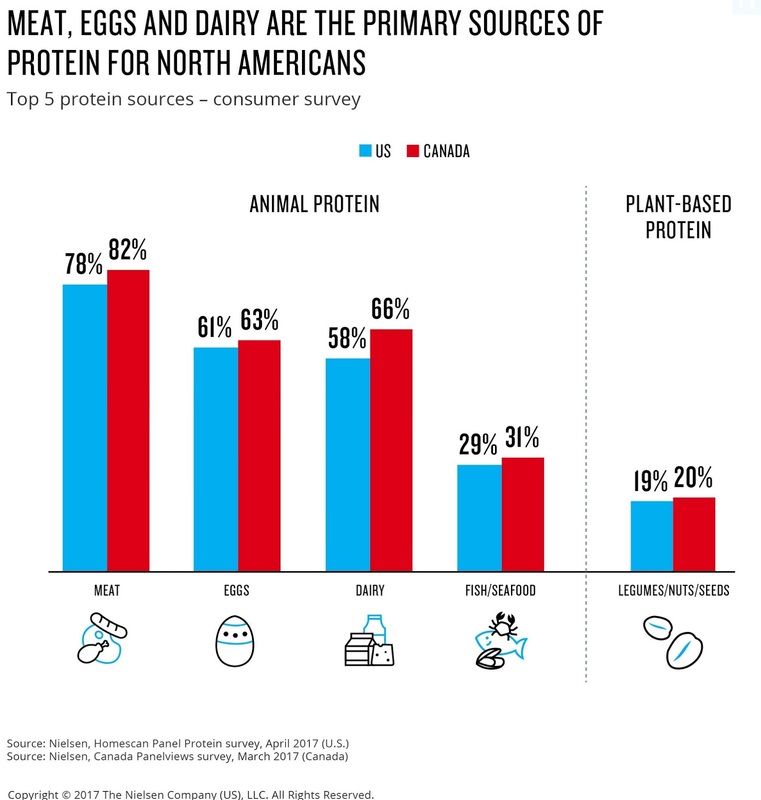 Both Americans and Canadians identified meat, eggs and dairy as their top-three protein sources, with seafood and legumes/nuts/seeds falling to fourth and fifth place, respectively. This presents opportunities for processors and marketers to keep dairy proteins relevant through innovation. One of the ways to do that is to put dairy proteins back into dairy foods. Another options is to use dairy proteins as a base for functional beverages. 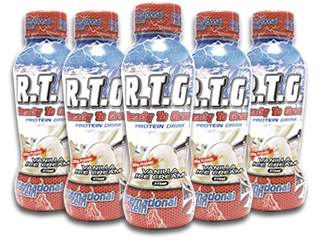 For example, Australian nutritional supplement company International Protein is debuting the Ready to Grow (R.T.G.) range of premium protein drinks. There are three drinks in all—Chocolate, Coffee and Vanilla—for, of course, those on the go who need a quick protein boost. Each 375-milliliter drink contains a massive 30 grams of protein derived from casein, whey protein isolate and whey protein concentrate. The drink is also loaded with 10 essential vitamins and minerals and only 90 calories per serving. It’s liquid protein, liquid dairy protein. The fact is that dairy foods are naturally loaded with nutrients and possess a fresh-from-the-farm image to complement many of today’s consumers’ dietary objectives, including weight management/satiation, clean-label/simple ingredients and local/authentic recipes. With all that, value-added products continue to gain traction as shoppers seek out foods and beverages that deliver above and beyond daily fuel. They crave flavor, nutrient density and convenience. And dairy foods can deliver. They can especially be designed to deliver the protein consumers want. The Nielsen data shows that half of Americans and Canadians have protein at every meal. About a third agree that source matters. Make sure they know that dairy makes protein sense. Advancements in ingredient technologies make on-trend innovations easier to develop. This was apparent at The International Whey Conference, which took place this past week in Chicago. Numerous developments in dairy fractionation and their applications—even beyond fresh and frozen dairy foods--were discussed. For example, scientists from Abbott Laboratories explored research showing how partially hydrolyzed dairy proteins can be added to infant formula powders enhanced with brain-health long chain polyunsaturated fatty acids such as docosahexaenoic acid (DHA). These fatty acids are highly susceptible to oxidation, with inappropriate storage and poor packaging accelerating breakdown. This causes the fatty acids to oxidize, producing undesirable fishy notes and potentially harmful byproducts. Chemically derived antioxidants can be used; however, in efforts to produce cleaner label products, naturally sourced options are being explored. Because it makes sense to put dairy back into dairy, researchers investigated the use of various dairy ingredients. They found that casein hydrolysate, as well as whey protein hydrolysate, functioned as effective antioxidants while also working synergistically with lecithin to ensure proper dispersion. Researchers from Anhalt University of Applied Sciences in Germany shared results from an investigation of using enzymes to improve the value of acid whey produced during the straining of Greek yogurt. The researchers identified that the Cryptococcus laurentii DSM27153 enzyme can convert lactose, the major constituent in acid whey, to galactooligosaccharide, a polysaccharide with prebiotic properties. With this conversion, acid whey goes from being a byproduct to the raw material for a value-added ingredient with application back into dairy foods and other foods and beverages. Scientists from Technical University of Munich in Germany shared pilot-scale results from a study to develop a preservation process for fluid whey concentrate, a viscous protein produced by membrane filtration. This is an energy-efficient alternative to whey powder produced by evaporation and spray drying. The challenge with whey concentrate is its water activity, which is too high to prevent microbial growth and therefore requires heat treatment for preservation. This negatively impacts the whey proteins in the whey concentrate, as they are very heat sensitive and will denature in extreme heat. The researchers developed a preservation process consisting of sterile filtration and thermal treatment to yield whey concentrate with high whey protein nativity of about 90% as well as an extended shelf life of about four months. Large scale experiments showed potential of this energy-efficient process in industrial manufacturing. Scientists from School of Food and Nutritional Sciences at University College Cork in Ireland presented findings on how including permeate enhances the solubility of plant proteins in foods and beverages. Their study explored the interactions between milk permeate and quinoa-based protein. Initial findings were positive and may transfer to whey permeate and other plant protein ingredients, such as those derived from beans, chia, hemp and pea. Specialty dairy proteins, both casein and whey, are being explored by processors in all dairy applications for their ability to increase protein content while stabilizing systems. This is particularly true in beverages, including refuel milks and meal replacements. Dairy proteins are high-quality proteins, also known as complete proteins, which means they are in a readily digestible form that can be utilized by the body. They contain all of the dietary essential amino acids in quantities that correspond to human requirements. Innovators should understand that proteins have different rates of digestion. This contributes to the unique function that an individual protein has on the body. For example, many health and wellness beverages combine a faster-digesting protein such as whey protein with a slower-release protein such as casein in order to deliver sustained energy. Get on board. Put dairy proteins back into dairy foods to make sure dairy is a consideration when protein intake is a priority. The ice cream and related frozen dairy desserts sector is experiencing a revitalization thanks to innovations in single-serve packaging and better-for-you formulations. The retail market has been relatively flat for the past two decades. That’s changing. Year-to-date (July 8, 2017) retail sales from IRI show ice cream sales were up 4.8% compared to the same period in 2016. Frozen novelties were up 1.5%. Low-sugar, high-protein ice cream is a driver of this growth. Enhancing ice cream or frozen dairy desserts with milk proteins, while at the same time decreasing added sugars, is an excellent approach to promoting ice cream as a healthful dessert, a snack or even a refuel food. Such better-for-you ice cream is not for everyone, but it’s definitely alluring to the growing health- and wellness- seeking consumer. This is why some of the larger players have taken note and are entering the category, which really just started gaining traction a few years ago when a number of entrepreneurs recognized this as an opportunity. After all, Nielsen data shows that retail ice cream sales reached $6.6 billion in 2016, up 3.4% from 2015. Conventional products are not the driver of this growth. It’s the better-for-you segment. Sales of products that fit within the FDA’s definition of “healthy” grew 85% in 2016. As competition continues to grow in the better-for-you ice cream category, brands are looking for ways to differentiate their offerings. Protein is proving to be one of those ways. This week at Expo East in Baltimore, a number of those original players in the low-sugar, high-protein segment introduced new flavors to their product line. A few other companies made their debut. One such player is ProYo, which launched two new indulgent flavors: Peanut Butter Chocolate Chip and Salted Caramel Crunch. At the trade show, the company also unveiled new packaging for its full line of nine High Protein Low Fat Ice Creams that more clearly touts the unrivaled amount of protein found in each container: 35 grams. 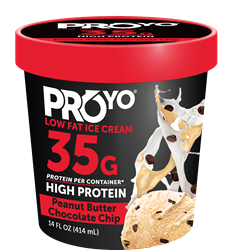 ProYo High Protein Low Fat Ice Creams are now available in nearly 4,500 stores across the U.S., and the company continues to support its fast expansion with robust marketing and sampling programs. 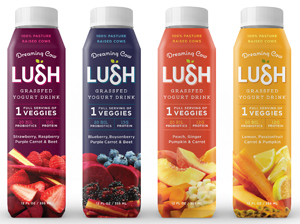 The two newest flavors were developed in response to consumer and retailer requests for indulgent flavors and increased inclusions. Like all existing flavors of ProYo, the two new flavors provide 2 grams of fat, 10 grams of protein and 120 calories per serving. A 14-ounce container has a suggested retail price of $4.99 to 5.49. The original seven flavors are: Blueberry Pomegranate, Coconut, Dark Chocolate Toffee, Dutch Chocolate, Mint Chip, Mocha and Vanilla Bean. The “World’s Best Gelato,” was crowned on Sept. 10, 2017, in Rimini, Italy, at the Grand Finale of the Gelato World Tour organized by Carpigiani Gelato University and Sigep Italian Exhibition Group. 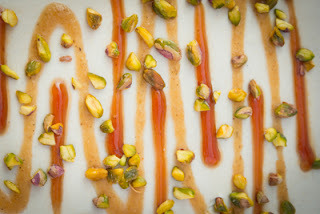 The winning flavor—Pistachio—is the fusion of three different Sicilian pistachios, two from Bronte and one from Agrigento. It was created by the artisan Alessandro Crispini from Gelateria Crispini in Spoleto (Perugia), Italy. The flavor innovation includes refined Cervia salt to enhance the taste by giving the flavor an extraordinary sapidity. 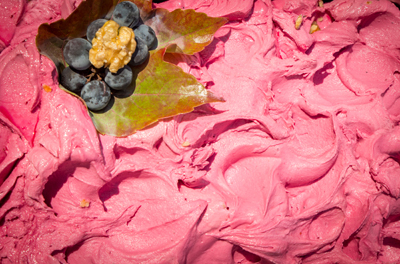 Guido and Luca De Rocco, father and son of Italian origin, residing in Germany, won the second place with their flavor “Tribute to Venice,” an Uva Fragola grape sorbet with caramelized nuts. The third place was won by “Amor-Acuyà” by the Colombian gelato artisan Daniela Lince Ledesma from Medellín. This exotic flavor mixes three different sensations: the sweet and sour taste of passion fruit, cream and Colombian 65% dark chocolate. The gelato possesses a unique bittersweet balance. There were 36 flavors competing, presented by just as many teams for a total of 58 gelato artisans from 19 countries. Here are the flavors, the country they are from and their description. Hopefully they inspire you for some future innovations. ARGENTINA – “Membrillo a la Crema” by Santiago & Riccardo Nieto from Portho Gelatto in San Juan (Camus, Rivadavia), is quince gelato with pistachio brittle. AUSTRALIA – “Gorgonzola & Pear Variegate with Figs and Walnut” by Michael, Brian and Teresa O’Donnell from 48 Flavors in Adelaide, is a balance of classic Italian flavors: Gorgonzola dolce made from pasteurized cow’s milk aged for three months mixed with pear and finished with walnuts and organic figs. 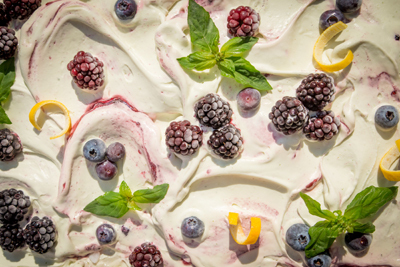 AUSTRIA – “Queen of Summer” by Katarina Rankovic, Manuela Strabler and Linda Peterlunger from Eismanufaktur Kolibrì in Wolfurt, is a light blackberry gelato made with fresh yogurt and lime juice. It has a light hint of organic lime zest and fresh organic mint. 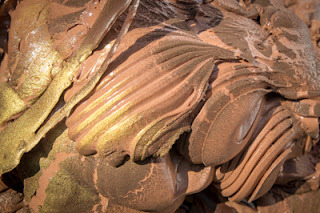 BRAZIL – “Grandiflorum” by Filipe Carniel and Mary Cellura from MU Gelato Shop in Florianapolis, is fondant cupulate (chocolate made with the roasted beans of cupuaçu) combined with another sorbet of Capuaçu’s pulp. CANADA – “Rich Chocolate, Bourbon, Truffle Swirl & Maple-Candied Pecans” by Tammy Giuliani from Stella Luna Gelato Cafè in Ottawa, is rich, decadent chocolate complemented by single barrel bourbon, which lends deep notes of vanilla, apricot and caramel. 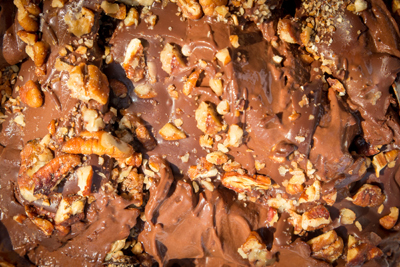 A velvet ribbon of dark chocolate ganache casts its spell, whilst pecans candied in pure Quebec maple syrup add a tickle of tantalizing crunch. CHINA – “Chinese Tea Gelato” by He Quingxia and Xu Dianmond from Ci Gusta! in Shenzhen, is a combination of Jasmine and Liupao tea flavored gelatos. CHINA – “Love of Rose” by Guo Hongwu from Ami Gelato in Zhangzhou, is a rose, sea salt and cheese gelato. COLOMBIA – “Amor-acuyà” by Daniela Lince Ledesma from Amor-acuyà in Medellín, is an exotic gelato that combines three different sensations: passion fruit with its sour and sweet taste, which binds perfectly with the cream, a homemade passion fruit variegate to enhance aroma, and a 65% Colombian chocolate. 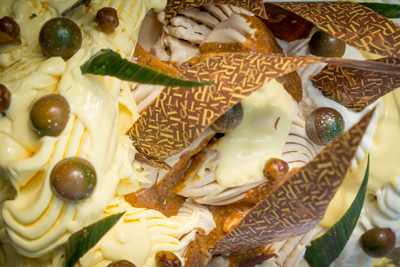 COLOMBIA – “Mediterráneo” by Lorenzo and Marcello Luciano from Arte Dolce in Medellín, is a gelato full of the Mediterranean flavors of orange, lemon, extra virgin olive oil, pistachios and almonds. GERMANY – “Tribute to Venice” by Guido and Luca De Rocco from Eiscafé De Rocco in Schwabach is a sorbetto base made with Uva-Fragola, or strawberry grape, from the countryside near Venice, and caramei, which is candied walnuts made following a traditional Zoldani art. GERMANY – “Golden Almonds” by Ezio Piccin and Fabio Cividino from Caffè & Gelato in Berlin, is almond gelato flavored with orange peel with a dulce de leche cream made with a hint of Himalayan salt that is mixed throughout along with caramelized peanuts and Dacquoise meringue pieces. GERMANY – “Kiepenkerl” by Aurora Perenzin and Manuel Rütter from Eiscafè Arcobaleno in Stadtlohn, is a Viennese almond gelato with a fine note of cinnamon and vanilla, marbled with a raspberry cream and topped with crunchy caramelized and chocolate-covered sunflower seeds. 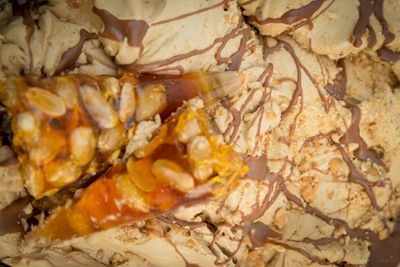 GREECE – “Salted Caramel Peanuts” by Dimitris Charalampous from Palladion in Rhodes, is sweet milk gelato with the finest Greek peanuts and soft salted caramel with a variegate of smashed peanuts and milk chocolate. HUNGARY – “My Chocolate” by Renáta Somogyi from Bringatanya Fagyizó in Gyenesdiás, is a sweet and sour gelato made of 70% saothomé dark chocolate, which originates from a specific region in Africa, and South American passion fruit. It is variegated with crispy crépe flakes and homemade chocolate sauce. ITALY – “Pistachio” by Francesca Mombelli and Cinzia Gazzolo from Il Vizio del Gelato in S. Nicolò (PC), is a premium pistachio gelato. ITALY – “Pistachio” by Alessandro Crispini from Gelateria Crispini in Spoleto (PG), is the fusion of three different Sicilian pistachios, two from Bronte and one from Agrigento, topped with refined Cervia salt. ITALY – “Cream of Extra-Virgin Olive Oil” by Alessandro Leo from Alexart in Corato (BA), is sweet mill gelato blended with extra virgin olive oil. ITALY – “Pistachio” by Bruno Di Maria from Ristorante Madison in Realmonte (AG), is an organic pistachio gelato with a hint of salt. ITALY – “Mandorlivo” by Francesco and Salvatore Manuele from Nuova Dolceria di Siracusa (SR), is a refined fior di latte gelato with almond nougat, extra virgin Tonda Iblea olive oil, grated lemon peel, a hint of citrus variegation and candied olive cubes. 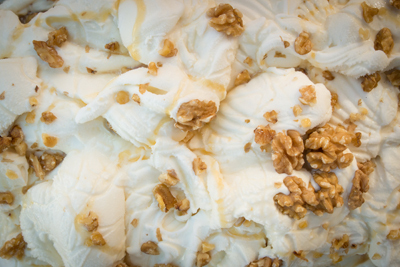 ITALY – “Sapore d’Amatrice” by Daniele Mosca from Il Gelatiere di Amatrice (RI), is a ricotta cheese gelato with chestnut honey and nuts. ITALY – “The Soul of Alto Adige” by Elisabeth and Alexander Stolz from Osteria contadina Hubenbauer in Varna (BZ), is a sorbet using ingredients produced by the Stolz family with a base of Tyrolean organic apples and flavored with crispy Schüttelbrot bread and Speck salumi. ITALY – “Milk & Wild Mint” by Silvia and Lara Pennati from Formazza Agricola in Formazza (VB), is a wild mint creation using local ingredients from the family farm. JAPAN – “Natsumatsuri (Summer Festival)” by Akira Hattori from le Verdure in Yokohama, is a combination of strawberry, rose, mascarpone and pistachio gelato. JAPAN – “Delizia al limone” by Yoshifumi Arita from Arita in Nagasaki, is a flavor inspired by the traditional Italian dessert of mini sponge cake filled and topped with a smooth lemon custard. 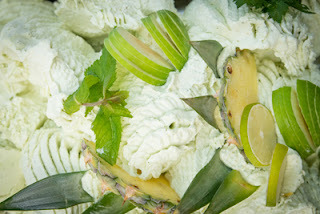 JAPAN – “Pineapple, Celery & Apple Sorbet” by Taizo Shibano from Malga Gelato in Nonoichi, is a sherbet that combines pineapple, apple and celery with basil and mint leaves, lemon and orange juice. LEBANON – “Rose Loukoum” by Nathalie Massaad and Walid Boustany from Caprices Du Palais in Keserwen, is made of rose water, rose syrup and rose loukoum. MALAYSIA – “Vanilla of the East” by Keewin and Seow Huan Ong from Cielo Dolci in Kuala Lumpur, is Pandan gelato accentuated with Tahitian vanilla beans, topped with hazelnut crumbs caramelized in coconut caramel and finished with a drizzle of Melaka Sugar. THE NETHERLANDS – “Honey-Yogurt Ice with Raspberry and Walnuts” by Erik and Hermien Kuiper from De Ijskuip in Denekamp, is yogurt gelato made with milk from Jersey cows combined with a flavor of spring honey and variegated with locally grown raspberries and walnut pieces covered in a homemade honey/sugar marinade. SINGAPORE – “The Asian Story” by Sharon Tay from Momolato in Singapore, is coconut milk and palm sugar with salty ribbons of homemade palm sugar caramel variegate with sea salt and crispy flakes of savory sweet bean curd. SLOVENIA – “Dark Smoke” by Ardit Ejupi from Sladoledarna Pingo in Šentilj, is dark chocolate gelato made with chocolate that has been smoked with cherry wood and flavored with bourbon whiskey. TAIWAN – “La Dolce Vita di Tè” by Yu Lee and Amber Lin from Ninao Gelato Classico, is honey black tea gelato sprinkled with pop-black rice. USA – “Cocco Sogno” by Angelo Lollino, Giuseppe Lollino and Ali Caine Hung from Vero Coffee & Gelato in Elmwood Park, Illinois, is a blend of creamy fresh coconut, velvety white chocolate and rich vanilla bean variegated with caramelized almond crunch. 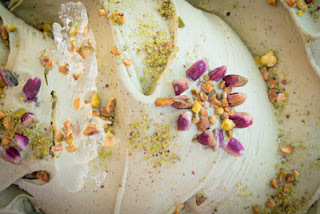 USA – “Saffron Pistachio with Candied Lemon Peel Gelato” by Gianluigi Dellaccio from Dolci Gelati Cafè in Washington, D.C., is saffron pistachio gelato with candied lemon peel. 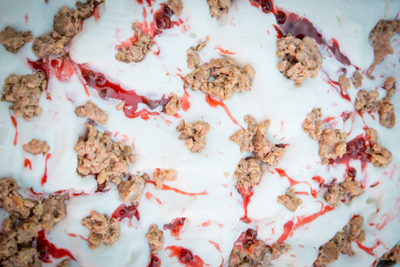 USA – “Breakfast at Nonna’s House” by Michael Meranda from Gelato D’Oro in Addison, Illinois, is fior di latte gelato with a marmellata of red currant (ribos rosso) and a vanilla almond granola coated with white chocolate amaretto. 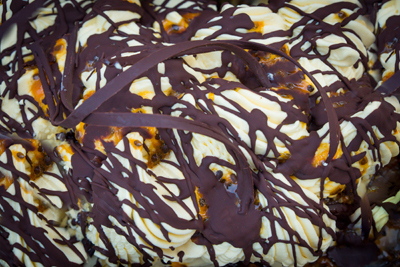 USA – “Bacche di Marsala” by Kelly Chu and Doran Matthew Cook from Cirsea in Charleston, South Carolina, is a honey and marsala wine gelato accented with a blend of lemon and goat cheese, infused with swirls of berry jam and cookie. USA – “Caramelized Fig” by Spin Mlynarik from Black Market Gelato in North Hollywood, California, is fior di latte gelato marbled with balsamic caramel soaked figs. 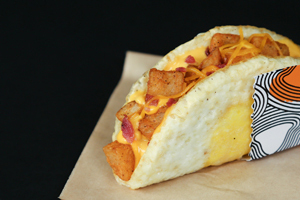 On August 31st, Taco Bell redefined the drive-thru breakfast by reconstructing and rebuilding the traditional American morning meal of eggs, bacon and potatoes. The new Naked Egg Taco delivers all these breakfast flavors in every bite. It features a fried egg shell—that’s right, a fried egg is the shell in this taco—stuffed with seasoned potatoes, bacon or sausage, cheddar and nacho cheese sauce. And it’s delicious! This is the sort of deconstructing and rebuilding that the yogurt category needs to entice curious shoppers, those that may have an eye for plant-based alternatives or simply crave a new experience. All yogurt is made with the same basic ingredients, namely milk and cultures. It’s the extras and how they pull the fermented milk together that will redefine the category. In the U.S., retail yogurt sales are down. Data from IRI provided to Dairy Management Inc., and courtesy of the Midwest Dairy Association show that yogurt retail sales were down 5% in the first half of 2017. 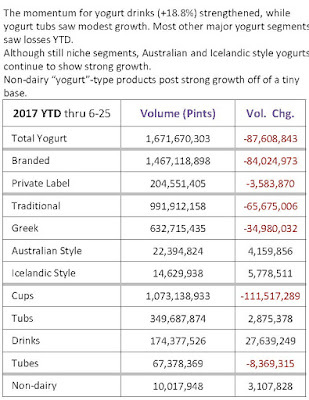 This volume decline continues the softer sales trend observed for yogurt in the latter half of 2016. This early 2017 decline in yogurt sales was observed quite broadly across regions, channels and segments of yogurt. There were a few bright spots. For one, yogurt drinks were up 18.8% over the first half of 2016. Whole-fat yogurt volume was up almost 25%, lifting its percent share of category to 13.4%. 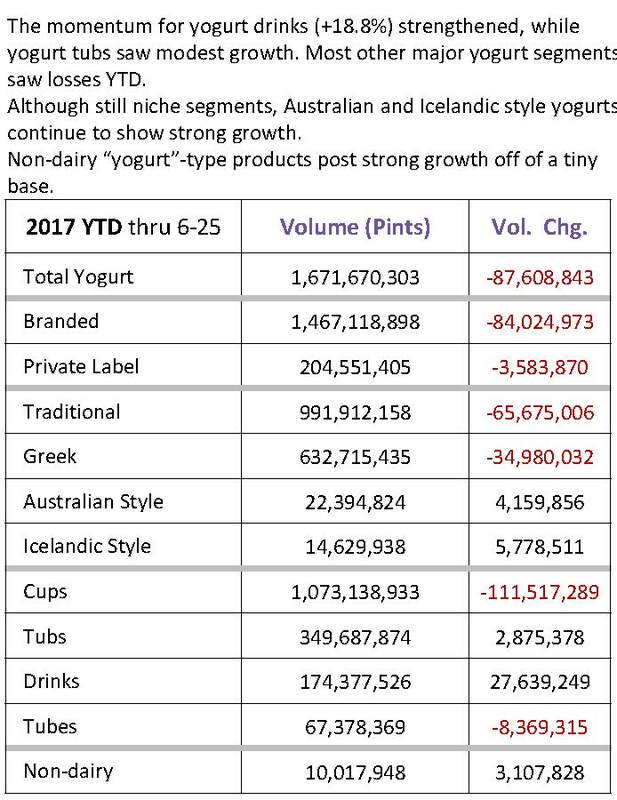 In addition, very strong growth continued for Australian and Islandic style yogurts, although these products are still niche in nature. Dairy foods innovators know one of the best ways to get creative is to explore what’s going on in foodservice. The challenge is to figure out a way to convert fresh concepts into retail products without losing too much in the translation. Packaging, graphics and merchandising are as important as the product. 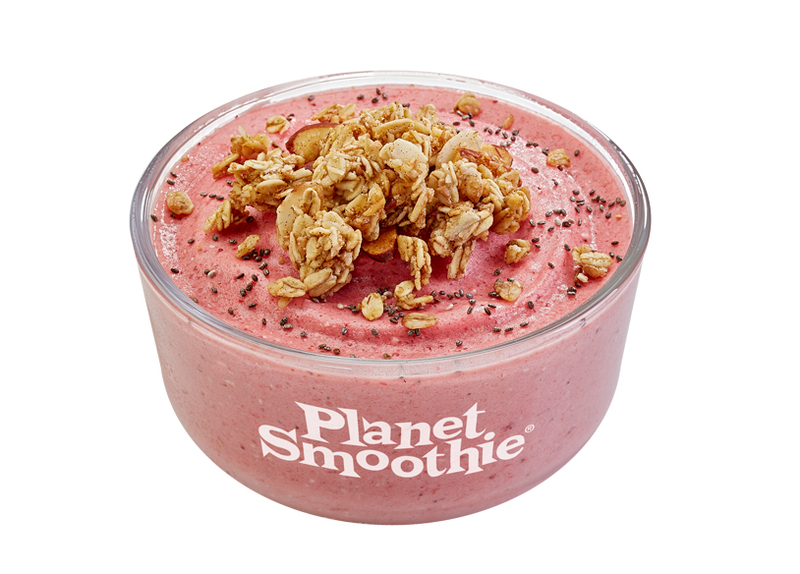 Here’s a concept rolling out at Planet Smoothie. I’ve written about smoothie bowls before, and rumor has it that a major brand is about to introduce a product that resembles it. 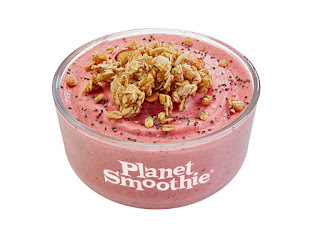 One of the three limited-time smoothie bowls from Plant Smoothie is Daybreak Crunch Bowl, which includes fresh fruit, Greek yogurt and whole grain oats. Just in time for back-to-school menu planning, Dannon Foodservice launched Snack Hacks, a program with better-for-you snacking solutions that make it easier for operators to accommodate new consumer demands and eating patterns. The program’s recipes incorporate Dannon Oikos Greek Nonfat Yogurt, which is available in bulk sizes. 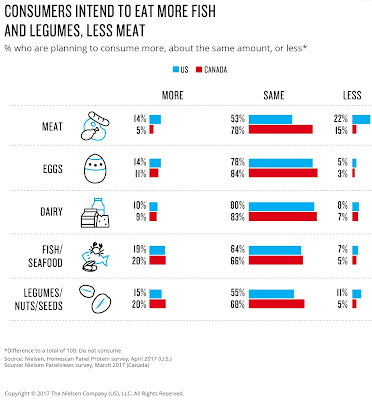 Its nutritional content appeals to the growing number of consumers who are actively adding more protein to their diets. The range of Snack Hacks recipe ideas encompasses parfait, overnight oats, hummus and salad options. The Citrus Avocado Parfait is yogurt mixed with avocado and honey, then topped with one layer each of kale, citrus salad and jalapeños, with a side of sunflower seeds in a to-go container. Creamy Tomato Bruschetta is yogurt mixed with garlic, basil and parsley, with a topping of diced tomatoes and balsamic glaze as a finishing touch. It comes packaged with parmesan crisps and crostini to create a portable afternoon snack. Peanut Butter Banana Crunch Overnight Oats combines crunchy peanut butter, banana slices and milk with a base of overnight oats made with vanilla-flavored yogurt, which gets topped with granola. In France, General Mills recently introduced two reconstructed yogurt retail concepts. 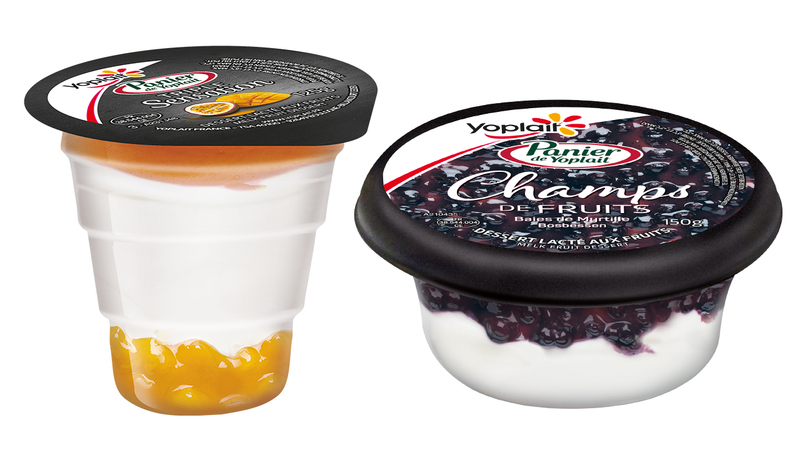 Yoplait Triple Sensation is a premium yogurt dessert line with half-candied fruit layered on top of creamy Yoplait yogurt. The third, bottom layer is a combination of two fruits. Combos are: passionfruit and mango, strawberry and raspberry, black currant and blueberry, and pear and apple. Sold in packs of two, Triple Sensation comes in clear parfait-style jars to showcase the three layers. There’s a bowl version of just two layers. Champs de Fruit containers are fruit-on-the-top yogurt desserts. Flavors are: Blueberry, Mango Passionfruit and Strawberry. Champs de Fruit also comes in two packs. These bowls are 150-gram clear containers. As with all deconstructing and rebuilding projects, it’s a good time to clean things up. Clean-label formulating continues to gain momentum, with the concept taking on different meanings in different food categories. Link HERE to read an article about “The complexity of clean label” that I recently wrote for Food Business News. Milk protein powders are increasingly being used in next-generation yogurt concepts to boost protein levels while replacing stabilizers such as gums and starches. Remember, the flavor of yogurt is determined by the ingredients in the yogurt base as well as the added flavorful ingredients. Stabilizers in the yogurt base can mute the natural flavor of yogurt as well as any added flavors. Milk protein powders can stabilize the yogurt through water binding, increased viscosity and a stronger yogurt gel, all while contributing natural dairy flavor that complements the yogurt rather than detracts. Milk protein powders, whey proteins and other dried dairy ingredients will be the focal point of the International Whey Conference taking place September 17 to 20 in Chicago. Held every four years, this is the meeting of the minds to discuss the dairy proteins marketplace. Topics include the state of the whey protein industry, overcoming processing issues when formulating foods and beverages with whey proteins, and developing affordable dairy foods enriched with powerful whey proteins. Regulatory, marketing and current research will be addressed over the three days of packed sessions. You can view the entire program HERE. The fact is dairy proteins are powerhouses. They can make a difference in the nutritional profile and ingredient list of many dairy foods, including cheese spreads, milk beverages, frozen desserts, yogurts and cultured dairy foods. They can boost protein levels and clean up ingredient legends.